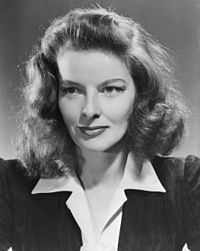 Ban-aisteoir Meiriceánach ab ea Katharine Houghton Hepburn (12 Bealtaine, 1907 - 29 Meitheamh, 2003). Bhí clú agus cáil uirthi dá bharr a chuma ceanndána agus a phearsantacht láidir, agus leann a gníomhréim ar aghaidh ar feadh thart ar 60 bliain. Tá níos mó gradam Oscar bainte ag Hepburn ná aon aisteoir eile. Go minic mná láidir, sofaisticiúla le leochaileacht nach raibh chun tosaigh a raibh á gniomhú aici. Mar pháiste bhí a chlann ina chonaí i Connecticut, agus thosaigh sí ag aisteoireacht nuair a bhí sí ag freastal ar an ollscoil. Tar éis treimshe a chaitheamh ar an stáitse, d'éirigh léi Gradaim an Acadaimh a bhaint amach dá ról ina triú phictúir "Morning Glory" i 1933. Ach foraor, tar éis é seo níor éirigh ró-mhaith lena scannáin ar feadh tamaill. Ach bean cliste a bhí inti, agus nuair a cheannaigh sí The Philadelphia Story díol siad é ar an gcoinníoll go raibh sí chun a bheith mar an bpríomh aisteoir sa scannán. D'éirigh thar barr leis an scannán, agus d'aistrigh siad é chuig cheolchoirm as a ndéantar an scannán High Society. Bhuaigh sí trí Oscar eile le haghaidh Guess Who's Coming to Dinner (1967), The Lion in Winter (1968) agus On Golden Pond (1981). Thosaigh sí ag deanamh scannáin teilifíse sna 70dí, agus lean sí a dhéanamh iad go dtí a blianta deireanacha. Rinne sí a scannán deireanach i 1994 ag aois 87. Tar éis treimshe gan obair agus lena sláinte ag ísliú, fuair Hepburn bás i 2003 ag aois 96. Bhuaigh Cate Blanchett Gradaim an Acadaimh dá bharr a ról mar Katharine Hepburn sa scannán The Aviator, faoi saol Howard Hughes (Leonardo DiCaprio), a raibh mar partnéir Hepburn ag bpointe amháin. Tugadh an leathanach seo cothrom le dáta an 8 Eanáir 2019 ag 00:19.